Tekeste Negash in his book Eritrea and Ethiopia The Federal Experience briefly mentioned that there were three type of shifta . Was Awate a shifta? If yes, was Awate involved in criminal activities during his banditry life? Excrept from the Eritrean Revolution: Born of a Shifta father, produced a Shifta system – part 2 and final. Furthermore Ghirmay Yeibio	in	his article Awate was a trigger happy ordinary outlaw (shifta): A hero of Fascist Benito Mussolini !!! Monday, 15 October 2012 wrote "Who was Hamid Idris Awate? What was his history? Hamid Idris Awate was a simple outlaw (shifta). An ordinary soldier entrusted with accomplishing a political goal charted out for him by ELF leadership in the Sudan. He never interfered nor tried to influence the political decision of the front, nor did he have the analyzing capacity of what he was doing. He was politically ignorant and was glad to do what he was trained to do his whole life and which he knew best how to do i.e. killing and causing mayhem. He was a trigger happy fascist loyalist who worked against the interests of the Eritrean people in particular and colonized Africans in General, who continued to fight the British forces, alongside Amedeo Guillet, to bring back fascist Italian rule to Eritrea even after Mussolini’s army had surrendered in East Africa to the allied forces. 1. ኣብ 1961 ክንደይ Eድመ ነይሩዎ? 2. ኣብ ብረታዊ ቃልሲ ኤርትራ Eንታይ ጸንቢሩዎ? 3. ኣብ ዝነበራ ካብ 1946 ክሳE 1961 ምንቅስቓሳት Eንታይ ተራ ነይሩዎ? ......"Concerning the person, the history and the activities of “Hamid Idris Awate”, in the Kunama land and upon the Kunama people, everyone knows, including the “awate.com”, too, (carrying his name), the team conducting it, and many leaders and members of the above enumerated organisations, that, “no one knows”, Hamid Idris Awate, “like and better than the Kunama people of the Kunama Tika region”, where he grew-up and was even a fellow-co-herder of some Kunama individuals, still living among us and testifying about the sad experiences, they had to make, after Hamid Idris Awate had suddenly changed his behaviour, became, a “villain”, a “murderer”, a “thief”, and started killing the Kunama (male), infants, men, women, young, old, and raided countless of their livestock. This is “history”, and a very sad history for the Kunama people who, are still recounting their family-members, relatives, friends and fellow-Kunama ethnic-members, murdered by and fallen victims of that cruel man. The teams of the two Kunama web-sites, speaking in the name of their fellow-Kunama, have often reminded the “awate.com’s”, team, to stop bringing in connection, the past history of the Kunama people with the name and history of Hamid Idris Awate, so as not to recall sad memories, in the minds of the Kunama people, and rekindle emotions, violent thoughts of retaliation and of hatred. For us and for our Kunama people, the lives of our people are much more precious than the “Eritrean Struggle”,( retained to have been started under the leadership of Hamid Idris Awate) and the “Eritrean Independence” itself, put together, of which we are yet to see its worth. No Kunama is against, if and whenever those organisations, their leaders, members, supporters and other fellow-Eritreans, who and which, though do very well know, the true background history of Hamid Idris Awate and of his criminal activities upon the Kunama people, are yet excited, exhilarated and “taken-high-up”, simply by his “shooting of the first bullet” to “start the Eritrean Revolution”, do stand-up, and are standing-up to “honour” Hamid Idris Awate as their hero and emblem of the Eritrean revolution, but the Kunama people are not to be expected or even forced into forgetting his criminal activities upon them, and start honouring him as their “national hero”. This is humanly and morally inconceivable and irreconcilable expectation. For the Kunama people, Hamid Idris Awate “was, is” and “remains”, one of the killers and co-killers of the Kunama ethnic-members. As said, many leaders of those opposition organisations, their members and many Eritrean individuals, do know, the background history and the criminal activities of Hamid Idris Awate, supposedly, up to the year, to the month, the day and the hour of his “first bullet shooting”, but also the sufferings the Kunama people, specifically, the Kunama inhabitants of the Kunama Tika region, had to undergo, caused by the homicidal activities and sprays of killings of Hamid Idris Awate. The stand, some of us Kunama are now taking, as regard to the present diatribe, “Kunama Peopleversus Hamid Idris Awate,” is not in defence of Mr. Kornelios Adolay Osman, but of our Kunama people and of their past sufferings, because, though differing only in quantity of their Kunama victims, Hamid Idris Awate and Mr. Kornelios Adolay Osman are both enemies of the Kunama people, for, both are equally killers of the Kunama people. unanimity, to call for the expulsion of the Kunama people’s organisation from the opposition, when the Kunama people were being slaughtered, like animals, by Hamid Idris Awate, in their own native and ancestral land? unit, led by the individuals, like “Hamid Dinai”, and others, operating in the Kunama territory, in the “1960s/70s”, and inheriting the very legacy of Hamid Idris Awate, had exchanged, the Eritrean struggle for “hatred, revenge” and for an all-out “vendetta”, against the Kunama people, and were carrying out all sorts of criminalities,, setting the Kunama villages ablaze, burning some Kunama villagers alive, and inside their own houses; among them, the late inhabitant of the Kunama village of Karkasha, “Amos, burnt alive” together with “seven”, (7), of his own family members, in “1967”? We have “eye-witnesses”, having live memories of those criminalities and condemning the “Jebha” itself. so-called “leaders” of the Eritrean independence struggle were condoning the systematic eliminations of many prominent Kunama, both, within and outside of their own units, simply for being “Kunama”? We have “witnesses” from both sides, recriminating those killings. in condemnation of the Kunama People’s organisation, for the simple statements, of a single Kunama individual, who has spoken his own mind and, supposedly “insulted” their “national hero”, Hamid Idris Awate, have never come out unanimously, to condemn, such injustices of the ruling regime, in the first place,? 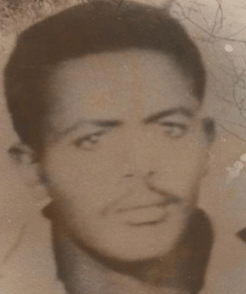 TESFAI HABTE: - (Notorious Shifta) Brother, of EMBAYE HABTE then the leading official of the Keren branch of the Unionist Party later became a cabinet minister in the Ethiopian government. Abdulkadir Kebire believed that only through education and unity can a people control their own destiny. Abdulkader Kebire who was a businessman funded many charitable projects including one for the establishment of a technical school in Mai Dshto in Akria, Asmara (Gabeel Team, 2005). Sheikh Abdulkader Kebire(1902 - 1949 ) who became a controversy by calling for the education of women, something, which was a taboo in those days. He believed that only by education and unity can a people be masters of their own destiny. These messages were his vehicle to the world of politics.